China has changed, is changing, will change more. The changes, according to Osnos, involve a collision of two forces, aspiration and authoritarianism. I see the starting point as being a necessary choice for China looking at Cuba, the USSR, and other Communist countries which resulted in rising expectations on the part of the citizens. We’ll see how this goes. Chapter 1 tells the story of Lin Zengyi, a young Taiwanese military man who defects to the mainland where his family was originally from. He succeeds but is arrested. There is also a chunk of history related to China in this chapter including how privatization got started this time round which is rather interesting. The changes in China are amazing in areas ranging from leisure time to consumer items, health care to income levels, internet to marriage and of course, entrepreneurship. Reading this I am astonished. But likewise, the necessity of “loyalty” continues – the laws about sterilization and unauthorized information (the internet) are in tact – anything which threatens the state (or is perceived to threaten the state) is not tolerated. In Chapter 3 Lin Zengyi, the man from Chapter 1, is interviewed and apparently will be discussed from time to time through the book. The ambitious young villagers leave for school and the city and then they have to *choose* their own mates and careers! OMG! This is a huge change for them and parents still push their own choices but “arranged” marriages have been illegal for along time. Men outnumber women about 3 to 1 which is more pronounced in the rural areas and the competition to find a bride who will have you is stiff – your personal future is more important these days than your family’s past. Dating services and marketing schemes using the internet abound. Chapter 5 – now to the nitty-gritty, “some Get rich” and some were fast about it. Deng Xiaoping declared that it was time to “let some people get rich first,” and that’s what some people did. (p. 60) That was back in 1985, though – it took awhile. And in 1992 Deng extolled development saying that it was “the only hard truth.” (Btw, Socialists question Deng’s communist credentials/ideas. There’s a big push to “Get Rich First,” Gong Hiayan now offers shares of her dating service company on Nasdaq and Osnos visits her at her home. Public jobs were closing down pushing more people into the job market. People got second jobs, made business cards, did “independent” things and made “individual” choices. This was a whole attitude which was abhorred by Mao and his followers. But the combination of “Get Rich First” and the new “independent thinking” resulted in new music, film, fashion, consumer items, etc. The people had little choice but to accept the changes – the party was now “conservative” in its approach. And Cheung Yang made her fortune in trash collection. (p. 68). There were lots of people with money -now you needed “class” (beyond money) to stand out. So many of these newly rich studied up on that! Some decided to learn English and the whole school boom was on. The English part was a huge break with the past. Another “character” is introduced to the reader – Li Yang is China’s most popular English teacher who teaches by shouting and calls his company Li Yang Crazy English. It makes a lot of money and the students seem to enjoy it but is it effective? – hmmmm… His wife is pretty down to earth, though. There’s a distinct “Chinese” feel to his sessions – big posters of himself around and slogans. One of Li’s teachers is named Zhang Zhiming (called Michael) and apparently not terribly happy in his job although he says and does all the right things. His brother has gone to the US to make a lot of money but it’s not working out as planned – nevertheless, they believe. Chapter 6 – so after the “got rich first” crowd has got their’s how do the others catch up? It’s choppy waters – many errors like small time medicine makers distributing tainted products. Some try short-cuts like gambling in Macao. And we meet Siu Yun Ping, a barber turned professional gambler, and his friend Wong a restaurant owner, who invested in other gamblers. Siu hit a really hot streak so Wong won, too, but Macao had turned into a hotbed of international crime, money laundering and weapon purchasing. The FBI knew and conducted an ingenious little sting. So Siu Yun Ping and Wong were in big trouble because the gangs suspected him of cheating at baccarat. The plot to kill Wong was foiled and the conspirators put in jail but the scandal reverberated up to the FBI and the offices of Adelson. (See Osnos’ article in the New Yorker for more info.) 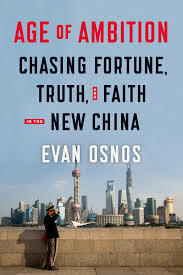 Many government officials skimmed their budgets and lost it in Macao – yet the Chinese government decided to leave Macau alone and let local band national governments handle their own problems with corruption – Macau brought foreign investment and “development.” And Osnos finishes up with Siu Yun Ping. Go for it! I certainly found plenty to write about (lol) and Osnos has written quite a lot in various places. And the organization of this book might be a good start.